Phil Robertson of Duck Dynasty is an American hunting enthusiast, businessman and reality television star with a net worth of $5 million. Phil Alexander Robertson, 67, is the patriarch of the Robertson family which owns and operates multi-million dollar hunting accessory company Duck Commander. He attended Louisiana Tech where he was the starting quarterback and star of the football team. Phil Robertson actually started ahead of future NFL hall of famer Terry Bradshaw. Upon graduation Phil Robertson had the option to play football professionally but declined because he didn’t want to miss duck hunting season. 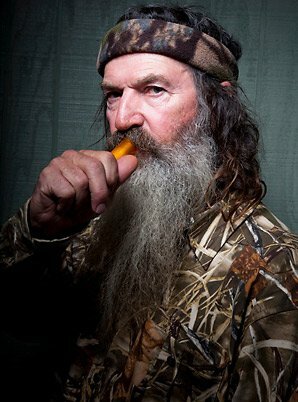 In 1973 Phil Robertson invented the Duck Commander Duck Call which eventually became the gold standard duck whistle among professional hunters. He owns and operates the business alongside his four sons, and wife Kay who have all helped turn Duck Commander into the multi-million dollar business it is today. The Robertson family and their business are so popular that they now have their very own reality show on A&E called Duck Dynasty. During the 10 week duck hunting season, Phil Robertson has a tradition of not showering or shaving ever to bring him luck.